We know what you're thinking and yes, this IS a huge counter and breakfast bar, but in a large family household or one that entertains regularly, you need that! 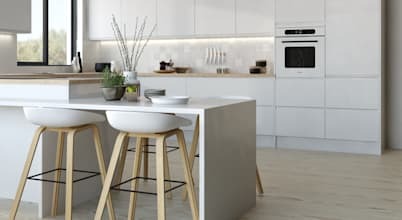 By choosing white for the main structures, the kitchen itself almost blends into the background, allowing the more sociable element to stand out and we really like that. Open shelves are fast-becoming a favorite element for us as well.